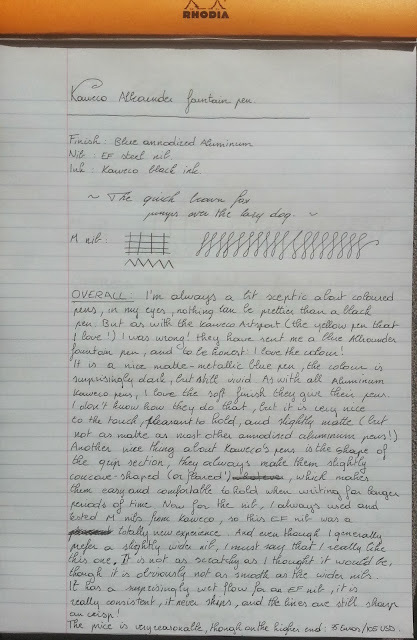 I buy a lot of black pens, because generally, I'm not a big fan of couloured pens. But for this pen, I'll gladly make an exception. In fact, I actually like the colour, not that I wouldn't prefer the matte black finish, but the blue colour is quite charming as well. The metallic blue is quite dark, and it does look quite classy in combination with the chrome accents! Even though the colour isn't my favourite, I still think it is a great looking pen. I love the way it looks and feels. 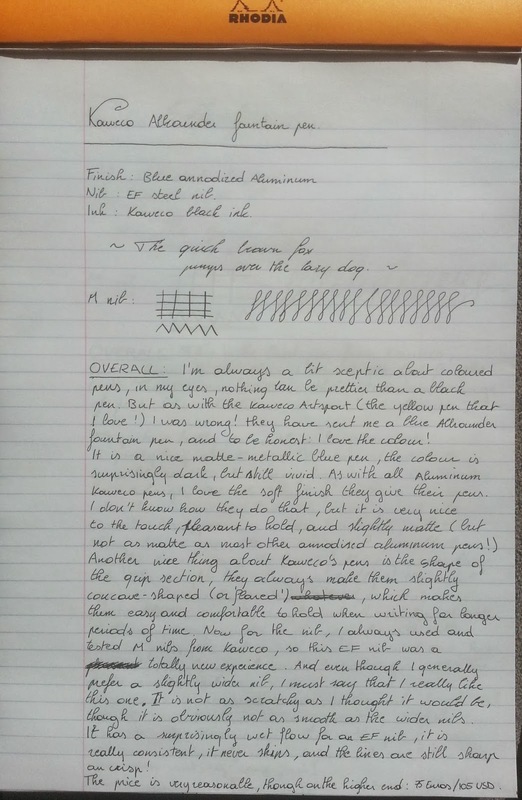 And I really like the size, it's not a huge pen at all (roughly 13.5 centimetres/ five and a half inches), but it felt just right when writing with the cap unposted. On the other hand, with the cap posted, it becomes much longer (16 centimetres/ well over six inches!) so it can easilly be used by people with larger hands. What I also like about this pen is the subtle 'etching' (I don't know if this is the correct word) on the cap, stating the brand, model and country of origin as you can see in the picture above. It is really small, but it gives a lot of personality to the pen. As with most Kaweco pens (that have a clip), it has that same retro-design, curved clip. 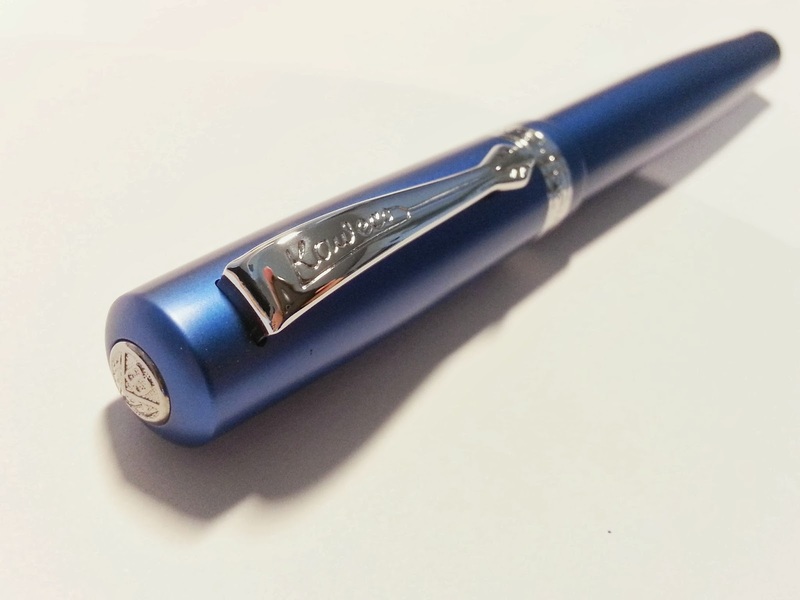 The center band has some very subtle engravings , together with the clip, and the etching, this gives the overal modern pen, a subtle retro look. As usual, I also like the grip section. 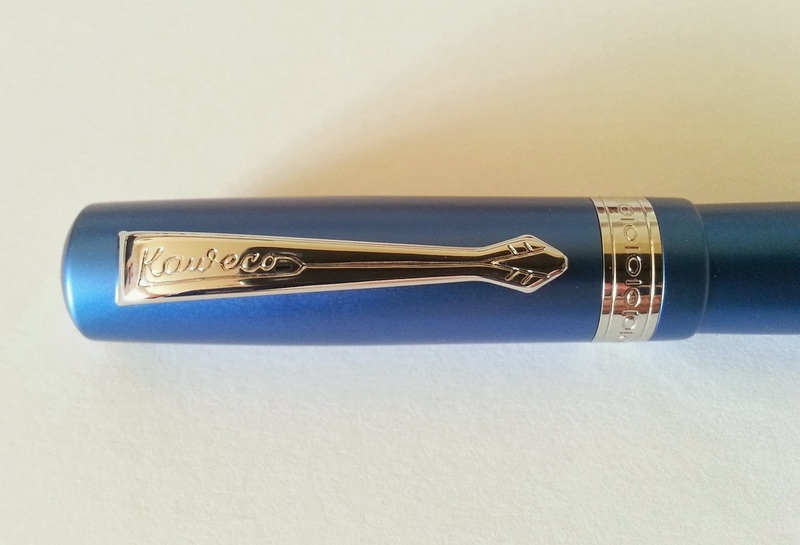 Kaweco seems to incorporate this flared grip section design in most of their pens. Which I don't mind at all, because it really seems to fit my preferences, it is comfortable to hold and it provides a reasonably secure grip. I do have to say that that the threads and step from barrel to grip section are quite noticeable with this pen, but then again, the grip section tends to keep my grip fairly low towards the nib, so I didn't get too much trouble from this and it didn't make writing with this pen feel uncomfortable at all. Now for the nib, I always used Medium nibs in my Kaweco pens before. So it was a pleasant surprise when I found out that it has an Extra-Fine nib. The difference between this and a medium nib is enormous, but I really like it so far! Everything that makes the Medium nibs awesome is also incorporated in this nib: It is really smooth, being such a fine nib I expected something much scratchier. It also has a surprisingly great flow, in the past I always had trouble with extra fine nibs skipping, but this doesn't seem to happen with this pen at all! Actually the flow on this pen is one of the best I've ever had, the lines are sharp and clean, and I didn't have any trouble with hard starts at all. So my overall impression about this pen is very positive. 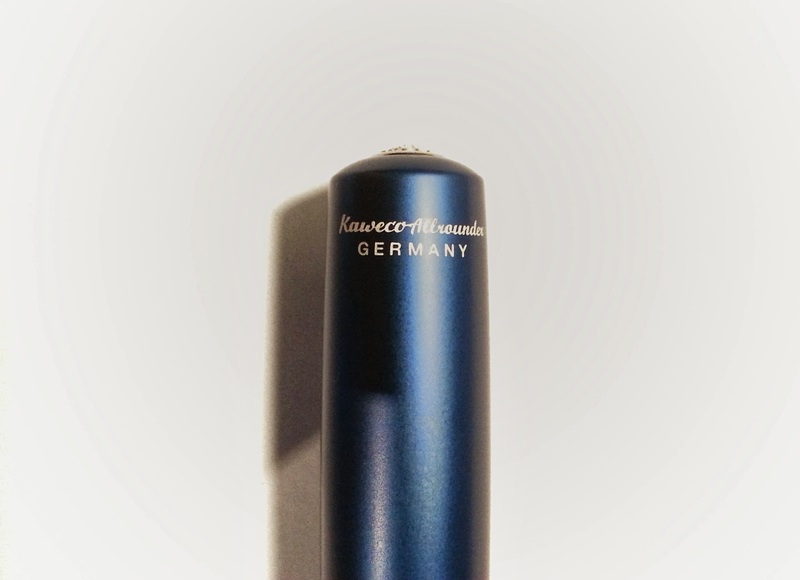 And even though the price is on the higher end of the kaweco collection (75 Euros/ 105 USDollars), it is still a very good price for the amount of quality you get! 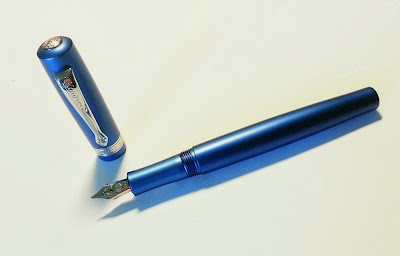 I would definitely recommend this pen to everyone who is really 'into' fountain pens like me, but people that don't have much 'experience' with fountain pens would probably enjoy it as well!